All Davonte Weatherford wants is justice. When Weatherford survived being shot by a Memphis, Tenn., police officer in 2017, protests erupted in the city. Memphians said it was another case of a black man being needlessly targeted by Memphis law enforcement officers, while local officials said Weatherford endangered the lives of police officers. To defend himself, Weatherford tried to get the police department to release the body camera footage from the incident. According to The Commercial Appeal’s Phillip Jackson, the newspaper filed a public information request for the bodycam footage. They also asked for the dashboard camera video and the surveillance video from a nearby business whose cameras captured the officer-involved shooting. On Monday, more than a year after he was shot by a police officer, after numerous attempts to get the city to release the footage of that fateful day, Weatherford somehow got his hands on the body camera footage that had been withheld from taxpayers for more than a year and he took the matter into his own hands. Weatherford says he received the footage from someone at the Claiborne Ferguson Law Firm. But Weatherford’s criminal defense lawyer, whose name just happens to be Claiborne H. Ferguson, would not confirm that he gave the footage to Weatherford, the Commercial Appeal reports. “You run again, I’m gonna kill you,” says an unnamed cop at the beginning of the video. Three seconds later, two shots ring out and the officer jumps out of the car pointing the gun at Weatherford, who is already on the ground. The cop asks Weatherford where the gun is and Weatherford points at a spot on the ground. 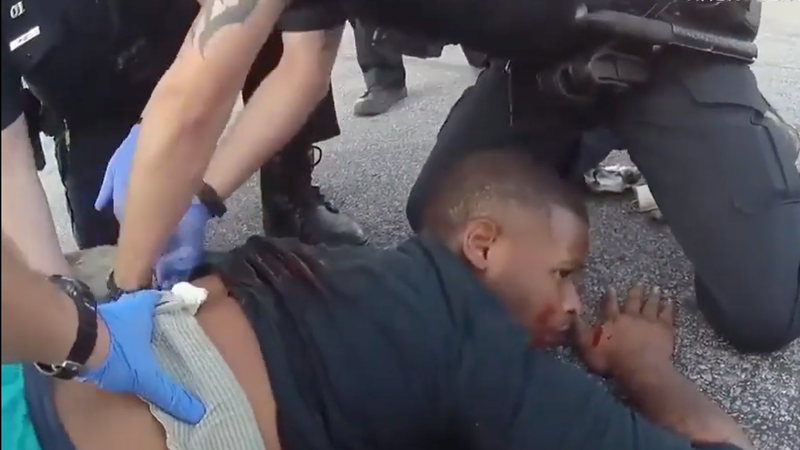 Although Weatherford is obviously wounded, the police roll him onto his stomach and handcuff his hands behind his back, where blood pools onto his shirt. A police affidavit detailing the officer-involved shooting says that at 6:23 p.m. on September 8, witnesses reported two men flashing guns “like a movie.” When officers tried to detain people in the parking lot, the individuals began to run from the police. The police department released a statement that said: “Officers pursued, at which time one of the suspects reportedly turned and pointed a handgun at the officers,” but the police have not said if Weatherford was pointing the gun or waiving the gun at the officer while running. Weatherford’s account of the incident differs. Weatherford said he was at the shopping center where the incident happened after an argument with his girlfriend. As he was searching for a ride, Weatherford said a group of people at the store got into an argument and one of the people pulled out a gun. However, Weatherford says that he didn’t initially run from the cop, according to an interview with the Commercial-Appeal. Weatherford then said he started to run after he remembered he had an unregistered weapon, but was eventually cut off by the cop car. The police department said the .380 Jimenez pistol that was found at the scene was reported stolen in 2015. Weatherford did not have a criminal record before the incident but now faces charges of aggravated assault, evading arrest and theft of property $1,000 or less. A later charge of unlawful possession of a weapon was added after the arrest when police say they discovered the gun Weatherford had was reportedly stolen. His next court date is on December 4. The Memphis Police Department says they did not release the footage, because their investigation is ongoing. The Tennessee Bureau of Investigation did not investigate the shooting because it was not fatal. Between 2010 and 2015, the Memphis Police Department shot 73 citizens, of which at least 38 were black, according to Vice’s data.